Newspapers/Grandview Heights Public Library/Photohio.org Collection. 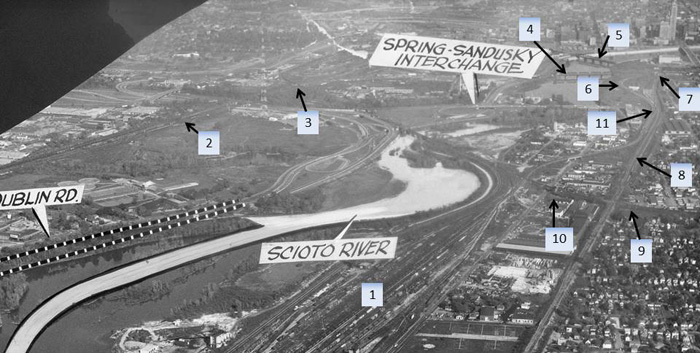 The Citizen-Journal (or Ohio State Journal) must have used this 1960s photo to illustrate changes to the Scioto River and the new four-lane highway for Dublin Road (Route 33). 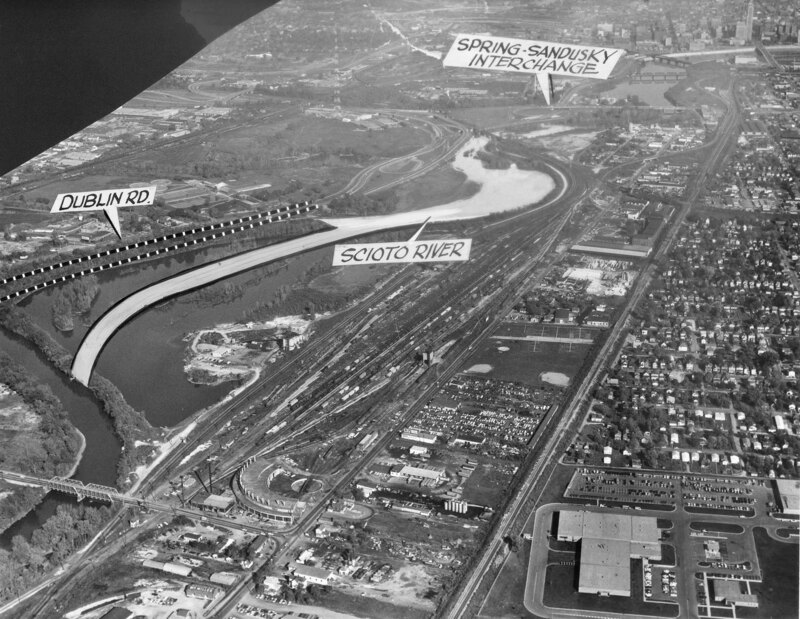 In 2018 everything you see in the middle of the photo has changed with the addition of I-670 and Route 315. Where the West Columbus Yard is shown is now the COTA bus barn on McKinney Avenue. 1. NYC's West Columbus Yard. 6. NYC (T&OC) mainline. 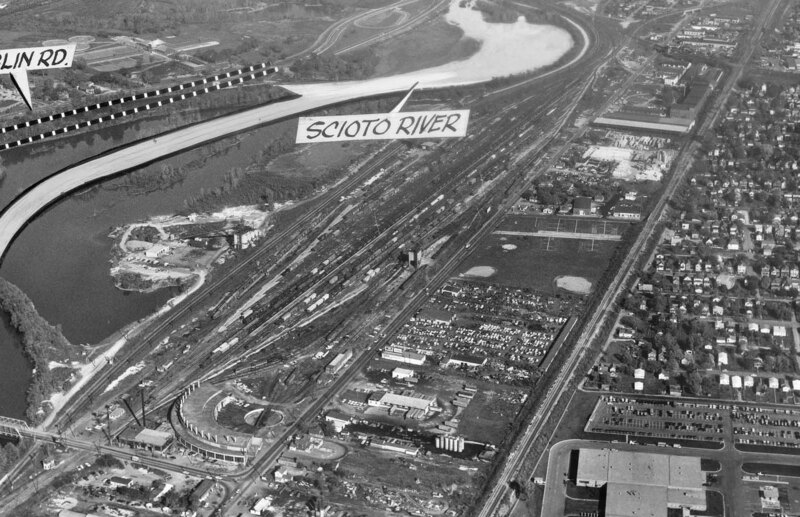 the Scioto River. 10. B&O's GN Tower. 2. Grandview Avenue 6. PRR-Little Miami mainline. 4. McKinnley Avenue 8. B&O's GN Tower. I worked the New York Central (T&OC) road trains and locals from West Columbus from about 1967-71. I spent many, many hours at Grandview Tower waiting for our northbound train orders. But it was fun. I think the river re-routed itself at some point. If I recall correctly (it has been 50 years) the area just across the Big Four tracks from the yard was a gravel or sand pit. It appeared the river deposited all those materials there and gradually curved out into an oxbow toward the north. The gravel suppliers appeared to keep dredging it out, working to the south. The yard itself was sort of a bowl, a few feet lower in the middle and rising up to the B&O diamond to the east and the Big Four crossing at the west. The yard crews would bump car cuts toward the middle, which would roll slowly down in there to make up the outbound. The yard was too small for the diesel era. We would come in from Toledo or Hobson with sometimes 100-120 or more cars and have to double or triple our trains into multiple tracks. I recall there being an interesting photo somewhere on Columbus Railroads showing the west end of West Columbus Yard, possibly taken from Grandview Tower during the steam era. This one has so much more. You can see all the way down to the Auburn Track just west of Miami Crossing, which was the T&OC interchange with the PRR. After Buckeye Yard opened, all our trains used the Auburn Track to cross to the PRR-Little Miami mainline for the run over to Alton and into the south entrance to Buckeye. West Columbus Yard was pulled out after 1969 leaving only a single track running from the Auburn switch up through the yard site, past Grandview and on up to Highway Siding and Mounds. The coal unit trains continued to use that route. I wondered if West Columbus Yard was built on a fill using soil or gravel from that River dredging area. The yard was about 8 feet above the level of McKinley Street and all that flat bottom area over to Broad Street. I thought your estimate of 1960 as the date of the photo is good. I cannot see anything here to suggest otherwise. I see Vets Memorial which was opened in 1955 or so. Most of the power idling near the roundhouse looks like F covered wagons. By later 1960s much of the power pool at West Columbus would have been GP9s and bigger SPs.